Though clean water is the backbone of our nation’s health and economy, the high cost of water infrastructure upgrades, not to mention the even higher long-term cost of delaying these fixes presents a daunting challenge for local officials. One year ago, a Presidential Memorandum directed EPA and other federal agencies to increase collaboration between the private and public sectors to meet this challenge by expanding innovative financing tools and helping communities plan for maintaining water infrastructure and developing new projects. This year, the Water Infrastructure and Resiliency Finance Center marked its one-year anniversary with a panel discussion at the Eisenhower Executive Office Building in Washington, DC. Panelists from water systems in huge urban centers and from smaller, rural locations were able to provide a broad perspective on the needs of different communities. During the discussion, George Hawkins, the Chief Executive Officer and General Manager of DCWater, noted that while technological advances and innovative funding mechanisms are available, many communities don’t take advantage of them because they don’t know which technologies or financing instruments would work best for their situation. Today, the Water Infrastructure and Resiliency Finance Center is connecting finance experts with local water officials to help communities build more sustainable, resilient water systems. In its first year, the Center hosted water finance forums, compiled best practices for utilizing federal and private financing programs, and is creating a clearinghouse to help communities develop revenue streams to finance stormwater and green infrastructure projects. In addition, the Finance Center recently announced the Water Community Assistance for Resiliency and Excellence (WaterCARE) program, designed to help communities develop finance strategies. 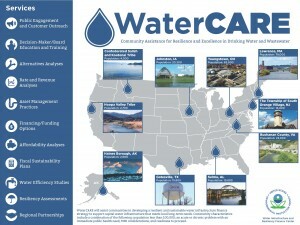 Ten WaterCARE communities will receive specialized assistance in developing plans to finance projects for safe, clean water. To learn more about water infrastructure, check out EPA’s website. About the author: Lori Reynolds works in the region’s Office of Infrastructure and Assistance, which provides funding to states for water and wastewater infrastructure. To sustain the investment, Lori and others in the office promote energy and water conservation and operation and maintenance planning to extend the useful life of infrastructure assets.